4E Psionic Power Sourcebook: So…where are the psionic powers? That is my biggest problem with the Psionic Power Sourcebook. It provides a few more options to players with respect to combat and class builds, but it provides nothing by way of rounding out what is arguably the most unusual character class option available to players. The Psionic Power Sourcebook proves, yet again, that the game-designers of 4E were more concerned with combat options than with role-playing options. It is unfortunate. In addition, the psionic power point system seems incomplete or rushed. It is a great start, but why stop at only replacing encounter powers? Why not give the psionic players more points and more options to augment there at will powers? Why have augmentable at-wills and then have daily powers? I feel like this system was not thought all the way through. Don’t get me wrong, I like the idea. I think it is a good start. 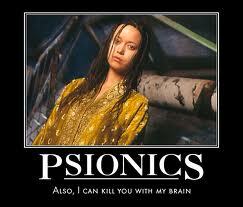 I think psionics should have a different feel than magic. It adds a nice element to the role-playing experience, but this system feels incomplete. Fortunately for me, I have a player who enjoys discussing rules and rule modifications. Fortunately for me, as I am in between jobs at the moment, I have a lot of free time to come up with my own set of Psionic Rituals that I am calling “Psionic Manifestations”. I will be presenting these when the rules are completed and play-tested. The basic idea behind these manifestations is that a successful psionic manifestation will give the psionic player an additional bonus to a skill. For example, a first level fighter trained in Athletics, with a strength of 18, will have a +9 to a jump skill check. So, to make a 20 foot jump (DC 20) they would need to roll 11+ on a d20. That is a 50% chance of success. Contrast with a 1st level psion who needs to make the same 20 foot jump. If they are not trained in Athletics and they do not have a strength bonus, they will have to roll a 20 to succeed. That is a 5% chance of success. But, if they use their Psionic Manifestation that I call “Mind over Matter” they can add their intelligence bonus to the roll in addition to any other bonuses to the roll. Therefore, if our psion has an intelligence score of 18, they can now succeed at the roll with a 16+. This effectively adds 2o% chance of success. While not as good as the trained warrior, the psion has just proven that the mind is truly a powerful tool. I will give more detail as I play-test the psionic manifestation system. September 21, 2010 | Categories: Product Discussions and reviews | Tags: 4E, psionics, role-playing, rules modifications | Comments Off on 4E Psionic Power Sourcebook: So…where are the psionic powers?